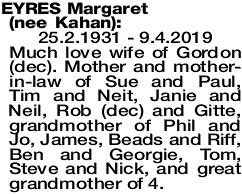 25.2.1931 - 9.4.2019 Much love wife of Gordon (dec). Mother and mother- in-law of Sue and Paul, Tim and Neit, Janie and Neil, Rob (dec) and Gitte, grandmother of Phil and Jo, James, Beads and Riff, Ben and Georgie, Tom, Steve and Nick, and great grandmother of 4. The Funeral Service to celebrate the life of the late Mrs Margaret Eyres of Claremont formerly of Peppermint Grove will be held at KARRAKATTA Cemetery commencing at 11.30am WEDNESDAY morning (17.04.2019) in the Norfolk Chapel.